Gillian can be contracted to teach anyone how to use WordPress. One-on-One Private tuition for Beginners. Charges are $50 per hour. SPECIAL DEAL! $150 for a half day. This is what you get for your $150: Up to 4 hours tuition – Location: at your office if its Auckland, or Gillians office. Prerequisite: For tuition we can work on a new or existing site, you must already have a hosting account and a domain name pointed in advance to the account, and access to all the logins. (you don’t necessarily need a WordPress installed on this account yet, if we are starting at the beginning). Therefore I check hosting and the domain registrar logins as well. Prior to our meeting we converse via phone and email. If you don’t have a site yet, this is not a problem, we just have to organise setting this up, 24 hours before use during your tuition/lesson. You would be responsible to put all your images together and documents onto a Stick, along with a document for the logins. If you don’t want to load up a real site for the purpose of the tuition, we can use a sub-domain as a test site to practice on. Prerequisite of editing a running site*: Prior to the tuition, you must email me a shortlist of what you want to achieve and what you want to change. Along with this, I will need login to the WordPress Admin, to check it is working. If I find that we have to do troubleshooting i.e. out of date themes and plugins, I would need ALL YOUR LOGINS in advance to see what is wrong. It would be unwise to arrange to have a lesson only to find the back end blocked and you cant start editing. For instance, I would need your login to hosting panel, (hosting co) and if there is a problem with the theme, I would need the login there. You may need to upgrade or purchase another theme. Believe me, some themes do break irretrievably. In that eventuality, I might also need your login to your theme authors support site. So the login to Themeforest, or wherever you purchased your Premium Theme. If other third party Plugins are not working for some reason, I might need the logins to those too. I will then check them all out that they are valid, and report to you we will be good to go. I will only agree to the tuition, if everything is going to work. You can book additional training sessions if we run out of time. You may also like to learn how to update themes and plugins, or manage Social Media and Google Products. Tuition is only available for supported WordPress Themes that have been downloaded from WordPress.org or Premium Themes from ThemeForest.net. I work with beginners and only use pre-designed, ready made themes that do not require hard-code programming. 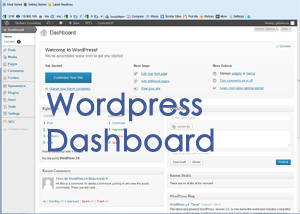 WordPress has an easy to manage Admin Dashboard that can be navigated by absolute beginners and no coding is required, to install, edit and maintain a wordpress website. I do not provide advanced database programming or customise coding/ or rewrite code /troubleshooting work on an already built WordPress site that was substantially customised by other developers. ** I do not work with Genesis Framework sites. In 2013 Gillian taught classes at Northcote Community Education, Auckland. These classes used to run each term. This course is an introduction to building a CMS or Blog WordPress website. We will install WordPress onto either a practice domain belonging to the tutor, or your own real live domain and webhosting that you have pre purchased at least a week before this class*. You can be a complete beginner just practicing, or someone who has prepared all their content ready to insert into a live WordPress website. Previous knowledge: you only need to know how to surf the internet, save files on drives of your computer, and send emails. You will learn all about WordPress in one day; how to choose and customise a theme, create pages, posts, and add images and galleries. We will also add menus, widgets, and plugins, the full works. You should bring all the content of your website, i.e. text and images, on a USB Stick if you are going “live”, or if only practicing in order to learn, then we will build a fictitious site. Please bring your lunch, tea and coffee provided..